Heat oven to 400&deg. In a large bowl, combine the flour, sugar, baking powder and salt. Cut in butter until mixture resembles coarse crumbs. Stir in 1-1/4 cups cream just until moistened. Fold in strawberries. Turn onto a floured surface; knead 10 times. Pat into a 9-in. x 7-in. rectangle. Cut in half horizontally. Cut each half into four rectangles; separate and place on a greased baking sheet. Brush with remaining cream. Bake for 25-30 minutes or until golden brown. Cool on a wire rack for 5 minutes. 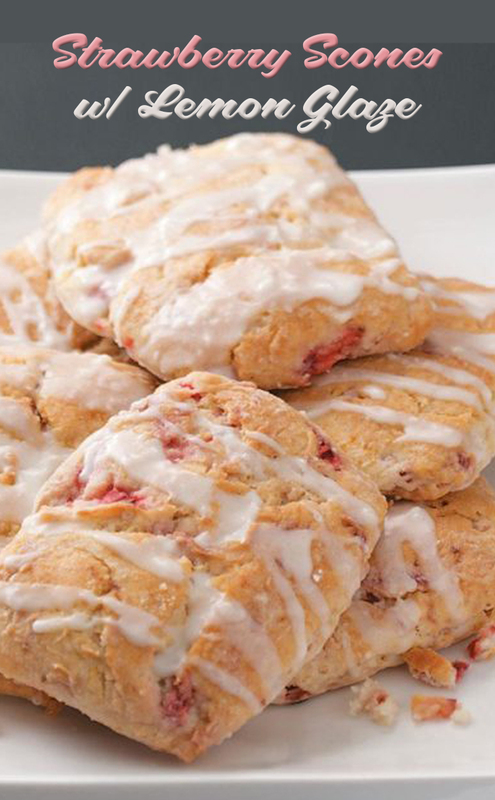 For glaze, in a small bowl, combine the confectioners' sugar, lemon juice, butter and milk; drizzle over warm scones. Serve warm.